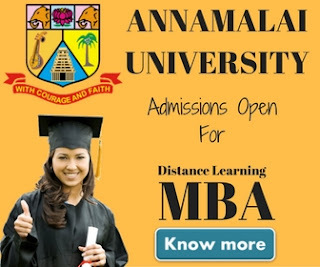 Anna University Distance Education MBA 2019: To strengthen professional education in India & to meet growing global trend of extending conventional University instructional mode to online, Anna university has started up center for distance education. Along with various other professional distance education courses, the university offers one general & five other sectoral MBA courses. In our today's post we're going to write about these courses & will also let you know about the admission process, eligibility criteria & fee structure. 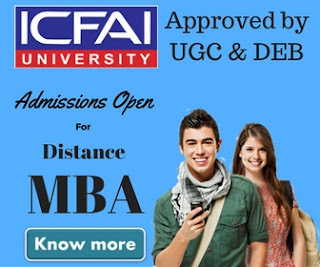 This post will help you know some insight about the distance education MBA courses offered by the university. As of now Anna university is offering total six distance education courses. The details of the programs are as follows. The candidate must have a Bachelor Degree, obtained under 10+2+3 or 4 pattern. Printed Application form can be obtained in person from the Centre for Distance Education, Anna University, Chennai - 600025. The cost of application form is 650/- payable in the form of Demand Draft drawn in favour of the “THE DIRECTOR, CENTRE FOR DISTANCE EDUCATION,ANNAUNIVERSITY, CHENNAI - 600025” and payable at Chennai. Those who want to get the application form by Post should send requisition letter along with Demand Draft payable at Chennai for 700/- before the last date. Application form can also be obtained in person from the following Study Centres located outside Chennai on payment of 650/- in cash. Ph: 0452 - 2090971 / 2090972. Ph : 0431 - 2331015 / 2331935. Application form can also be downloaded from the website of the Centre. In such cases the candidates should enclose a Demand Draft for 650/- along with the completed application. Completed applications should be sent to “THE DIRECTOR, CENTRE FOR DISTANCE EDUCATION, ANNA UNIVERSITY, CHENNAI- 600 025.” Candidates who are submitting completed applications in person can obtain their Hall Ticket immediately. Candidates who qualify in the Entrance Test will be provisonally selected for admission. A rank list will be prepared based on the marks scored in the DEET and admission is based on the rank obtained. A separate rank list will be prepared for TANCET candidates based on TANCET score and they will be considered for admission as per their rank against the seats set apart for them. Differently abled persons (Hearing, Visual and Orthopaedic) are exempted from payment of tuition fee i.e Rs.3000/-.